Swachh Bharat Mission (Gramin), Assam launched a massive Campaign titled “Mission Sambhav” across the State on 26th March 2018. This campaign was inaugurated by the Chief Minister of Assam, Sarbananda Sonowal in a central ceremony at Gopal Krishna Tea Estate, at Nelli GP in Mayong block in Morigaon district. 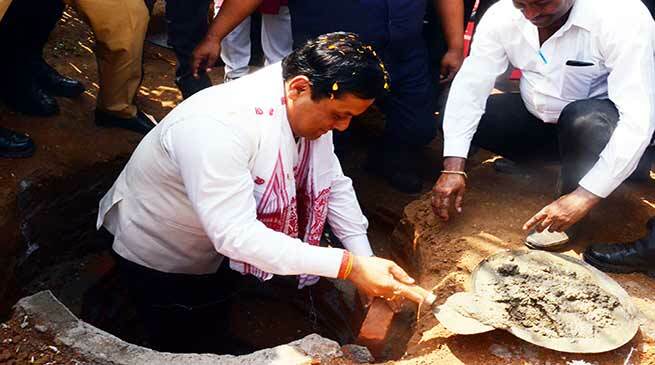 The Chief Minister flagged off the campaign by digging pit for sanitary toilet in the house of Romesh Paharia, a tea garden worker residing in Gopal Krishna Tea Estate. The central theme of the Campaign is to reach out to more than 1(one) lakh families without toilet on a single day for toilet construction, starting with pit digging. Mr Sonowal while addressing the gathering of more than 8000 people, stated that the Mission Sambhav is taken up across all the 33 districts covering 219 blocks and would witness coming together of thousands of motivators sensitizing community about sanitation leading to Swachh Assam. He stated that this campaign aims to promote mass mobilization through local public representatives, local units of Police, Army, Para Military Forces, CBOs, NGOs, Colleges, Universities etc to get directly involved with the Swachh Bharat Mission by offering “Shramdaan”. When asked to Romesh about his feeling , He stated that ” i never thought even in my wildest dream that CM will dig pit for a toilet at my residence. He promised to always use Sanitary Toilet and disseminate the message of cleanliness to others in their area”. The launch of “Mission Sambhav” also witnessed donating of 10 nos of toilet by the dignitaries and officials present. SBM(G) promotes the concept of “Daan Toilet” which emphasizes on donating of a sanitary toilet to a person who does not have a sanitary toilet. Through this noble initiative, SBM(g) wants all the rural people of Assam to have access to sanitary toilet. After the pit digging exercise, the CM and other dignitaries planted trees in the Tea Estate, sending a strong message to protect our flora and fauna and with a hope that these trees will witness a Swachh Green Assam.